Buffalo Grill, with its pseudo American red and white hoardings is a familiar site from dual carriage ways and motorways across France. It’s somewhere we’d been curious about. Was it cheap? Was it tacky? Was it one of these much mooted French roadside restaurants where the food is low price and high quality? As we wouldn’t normallly stray onto out of town industrial estates and retail parks, we’d not previously found ourselves in the vicinity of one when it was meal time. Empty stomached and oblivious to any grocery stores likely to trade before Monday morning, Buffalo Grill was (we hoped) our saviour. From the outset we were impressed. Everyone at the table was served with an hors d’oeuvres salad and a basket of warm bread wrapped in a cloth napkin. My husband and I each ordered the promotional set menu “Le Burger Trip” comprising choice of bacon burger or bavette (steak) with a dessert and drink. I’ll cut to the chase. After the morning we’d had, I was in serious need of a burger. Now this might look fairly bog standard and McDonalds like but it was a great burger with chunky meat and a bun of substance rather than fresh air. The fries, I’ll admit were not the best but respectable. We were even offered fries refills. (I declined). Ted had a kids’ portion of cheese burger with chips. We had a worrying accident with some ketchup but I think we got away with it. My father had the only fish dish on the menu – salmon with rice and vegetables. Buffalo Grill has a similar American, identikit buildings feel to Frankie and Benny’s in the UK however the menu is more similar to Byron Burger. Prices were a reasonable £12 per head for 2 courses plus the salad appetiser. I even begged my husband for us to go back later in the week when the range of local restaurants proved disappointing (he refused saying we were in France and couldn’t go out for burgers twice). And as if this wasn’t enough, they have a play area. We hoped Ted would pick up some French however with his bossiness, it’s more likely the French kids picked up some English. Buffalo Grill was clean and smart with attentive staff. It’s wall to wall burgers and steaks but if you’re ok with that you’ll enjoy. 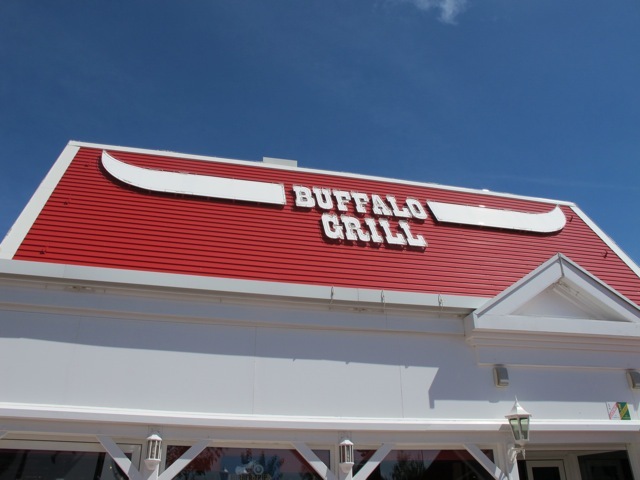 Buffalo Grill – branches peppered nationwide across France. Sadly they’ve yet to launch in the UK although there are a handful of branches in Spain, Belgium, Luxembourg and Corsica. We travelled as guests of Siblu holiday parcs. Read my review of Siblu Les Pierres Couchees here.